Mobile Technology Solutions for the 21st Century. The LCO Group can help you stay connected while on the move. 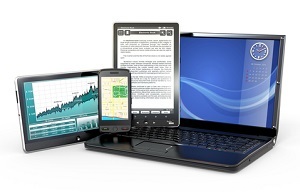 The use of mobile technology in business – from laptops, to tablets, to PDA’s, to smartphones – is growing exponentially, and encompasses every aspect of your firm’s technology environment. The companies that utilize this new technology better than their competitors enjoy a significant competitve edge in this era of information. The simple definition of mobile technology is the extension of your hard-wired infrastructure to allow your employees, customers or suppliers real time access to internal applications, data and devices from outside of your physical local area network (LAN). Once again, implementing mobile technologies because of the buzz or hype are not valid reasons for adding these capabilities. Today, work is no longer limited to a specific place. Your employees are out in the field, telecommuting, in meetings, away from their desk or just constantly on the move. But without access to your company network this time away from work is unproductive or even wasted. Some of the most common mobility requirements for employees are around email access. Solutions that could be deployed include web-based email access, Outlook RPC over HTTP, and wireless email access via a PDA, SmartPhone or Blackberry. These solutions range from basic to advanced. Basic solutions may only allow read capabilities, while advanced solutions can synchronize data and allow access to calendars, contacts and email folders. Another common mobility category is data, database or application access. This can be achieved through thin client solutions such as Terminal Services or Citrix or a VPN. Each solution has its advantages and disadvantages and should only be deployed after careful consideration for the user experience, type of data being accessed or transmitted, internet connection speed and device with which the user is accessing the data (laptop, hand-held device). There are many technologies that can help your employees be productive while they are away from the office, but each one has its share of security, scalability and infrastructure pitfalls. At The LCO Group, we can keep you connected.